At a recent meeting, Beverly Hepting gave a fantastic educational speech on Impromptu Speaking for Table Topics. How many of us ‘dread’ Table Topics? Yet we speak off-the-cuff every day. We don’t plan and prepare our response in normal conversations or to questions in meetings. Maybe we need to change our thinking about the word ‘impromptu’. Actually Table Topics is right, as it is what we would normally talk about round the table with friends. Table Topic Masters can do more in their introductions to emphasise this and set a positive attitude. The right choice of subject can also help. Here are the ten tips we learnt from Beverly. You don’t have to rush up there. Give yourself thinking time. When you get on stage, you don’t have to start straight away. Take time to get grounded and not panic. Start with the end in sight. It is a bit like going on a journey, you need to know your destination. If you know how you want to end your speech, you can then quickly plan your route to getting there. As with any speech, it should have a start, middle and end. If you know the end, you can build a strong start and fill the middle. The danger is we are likely to try and over complicate things. Keep it simple. Just have one or two points that you want to cover. You only have two minutes after all. There are several tricks you can use to buy yourself time to think. A common one is to repeat the question. You can use a short quip or change the subject. Using pauses is a great way to gather your thoughts, calm your nerves and add impact. It is also a chance to breathe! Using the stage to good effect can add interest to your speech and use up time. When adrenaline is running, the danger is we speak much quicker. Try and pace yourself and slow down. Less is more. Don’t let panic take over your mind. Stay in control of your thinking and go with the first idea that comes into your head and build on it. The less you panic, the more your creativity can work. Once you get started, keep going. Let your mind freewheel. Focus on what you want to say and not the lights. You don’t have to speak until the red light comes on. If you’ve finished – finish! Here we come full circle to having an end in sight. End with a bang and not a whimper! Have a strong ending which concludes your speech. I give my sincere thanks to Beverly for these tips. It’s now about putting it into practice. I saw people do that immediately after her speech and it worked. It can be a scary proposition when giving a speech, being evaluated or taking on a role at a meeting. When the brain feels threatened, it releases adrenaline and this impairs the mind to work as effectively and creatively. The focus under threat is fight, flight or freeze. Recent research in neuroscience has shown that there are five interpersonal primary rewards or threats that are important to the brain. David Rock of the Neuroleadership Institute created the model of SCARF. If you can find ways to increase several of the elements of SCARF at the same time, either in yourself or others, you not only have a powerful tool for feeling great, but also improving performance. You can demonstrate compassion by providing what the brain craves. How does SCARF apply to a Toastmaster club? I believe it has enormous relevance in creating the right atmosphere. Using the principles of SCARF you can create a warm, humorous and safe environment, where members and guests can perform to their highest standards. You may like to consider evaluating the SCARF for your own club, leadership, or evaluation. What could you do to improve your SCARF? I used this in my general evaluation at a recent club meeting and below are my observations. What could you do to help people feel more valued? When guests arrive, it is important to find out their names, welcome them and make sure you say their name correctly. The President can set the tone of the meeting in their introduction to help everyone feel welcome and important. When you come onto the ‘stage’, you can help your own status by getting grounded and having a confident stance and presence. Evaluators can raise status by giving positive, constructive and praiseworthy comments. Negative feedback can be delivered without devaluing the receiver. What could you do to establish clear expectations? How could you reduce uncertainty? Every role holder can create certainty by setting the expectations and clearly defining their role for the meeting, especially for guests. The agenda gives certainty of what will happen in the meeting. It is the Toastmaster’s role to be well prepared and make sure that is achieved. Evaluators can state in their introduction what they are looking for in the speech. They can be clear and certain in what they like and their recommendations. If using terms like ‘transitions’ or ‘rhetorical questions’, explain their meaning as not everyone may understand. What choice can you give people? How can you empower people? You can check with the speakers what they want to be evaluated on. The Pathways programme may give more choice of topics, but some members may need help with this. Timing of delivery can give autonomy rather than be imposed. Involving people in meetings can help them feel empowered and more part of the club. It creates variety when people can choose a different way to explain or carry out their roles. Use of language in evaluations can impact on this. Words like ‘could’ can be used rather than ‘should’ for example. Using rhetorical questions in speeches gets the audience involved and thinking. What actions could you take to improve trust? How can you improve team relationships? Warmly welcoming guests can help them feel part of something. The room layout can isolate people or encourage togetherness. Trust in the roles tends to come from being prepared to deliver a professional performance. Evaluators can show empathy and respect for the speakers in how they give their feedback. The Table Topic Master can make it easier for participants by loudly and clearly stating the question and then repeating it after choosing someone. Using appropriate humour builds easy rapport with the audience. How can you improve people’s perception of your fairness? What can you do to show your integrity? Properly preparing for your role is showing integrity to keep your promises and being fair to the audience. Evaluations are clear, true and fair. As an evaluator, you may have to recognise your own mistakes. E.g. Saying a lot of ’ums’ whilst picking this out to the speaker. What will you do to wrap your Club in a massive SCARF? I recently completed my final project from the advanced “Speeches for Management” manual – delivering bad news. Through the introduction by both the evaluator and the Toastmaster; I made sure the audience was aware that they were role playing. They were to be the workforce of a manufacturing plant in the UK, which was under threat of closure due to the US parent company considering relocating manufacturing to the States. Below are the key lessons that I took from preparing and delivering the speech. Delivery of the message was going to be even more important than the message itself. I needed to come over as calm, professional but also approachable. I wanted to inspire the audience to feel that despite receiving bad news, there was hope; especially if they had an optimistic view of the future. So I gave far more attention to what I was wearing (professional attire) and how I was standing (confidently anchored and holding a clip board so that it didn’t appear that I was speaking off the cuff or unprepared). There were plenty of pauses to enable people time to take in the bad news, although some of the feedback suggested I could have made even more of the pauses! I allowed for questions so that I could demonstrate my commitment to each member of the audience. Definitely don’t waffle; give the bad news clearly and concisely. I did give reasons behind the decision, but again these were brief and to the point. I found it easier to think of the speech in two clear halves – the first was the bad news, the second was the potential opportunities to mitigate that news. Each half had a different pace and feel. I looked to positively recognise both individuals and the overall team’s contribution to performance to date, so that despite the overall feeling of bad news there were still positives to take away. I had been concerned ahead of giving the speech that it would feel odd given that it was effectively a role play, but once I was in front of the audience I found it easier than I’d expected. I actually enjoyed being in ‘role’. Caroline Brewer completed her Advanced Silver Communicator with this speech. We simply need to gain 5 new members between 01 August and 30 September to receive a club ribbon and a 10% discount code for Toastmasters merchandise. More importantly, it keeps our club stimulated and energised by attracting new members. Come on Casterbridge, spread the word! A key part of any Toastmaster meeting is the opportunity to evaluate speeches and roles. Evaluations allow you to give people constructive feedback. Frequent, quality feedback ensures improvement, which is what many come to Toastmasters to achieve. Here is a summary of a recent webinar given by the Neuroleadership Institute on the science behind how the brain likes to receive feedback. It may help you make your evaluations even more effective, not just in meetings, but in other areas of your life too. It is an essential leadership skill for you to develop. People improve more and faster with regular feedback. Greater improvement comes from frequent, targeted input from many sources. If done incorrectly, it achieves nothing or makes matters worse. Poor evaluation can be discounted and ignored by the receiver. Conversations that provide insights and help people improve by facilitating positive change. Feedback (positive or negative) is information about past behaviour and results, in order to raise awareness and create choices for development. Feedback should be based on facts and backed up with evidence and examples. Feedback is NOT criticism. Criticism, by its nature, causes a threat, which reduces the brain’s capacity to accept it. We think people hate getting feedback. Research shows people actually WANT feedback. What people don’t like is unsolicited feedback or criticism. At a Toastmaster meeting, members know they are going to be evaluated, so it is rarely unsolicited. If you feel you have to give unsolicited feedback, ask their permission first. This will help reduce the threat. Feedback should focus on problems – what people are doing wrong. Yes it can outline errors, but we can over focus on this. People need to know what they are doing right too. Experienced members know more and should be the ones to give feedback. Members come from all aspects of life and work. They can be experienced in what they want or don’t want to hear. Learning to evaluate is part of their development too. We have to only GIVE feedback. No, why not start ASKING for feedback? Toastmaster meetings should be a culture where people feel empowered and confident to ask for it, even if it is something not ‘officially’ being evaluated. Focus on what they need to build on (strengths) and then what they need to refocus on (recommendations to improve). Think about the words you use. Compare ‘How I think your speech could be even better is …’ to ‘what you did wrong was..’. Use mental contrasting. The brain loves this. Get them to see where they are now and where they can get to in the future. Help activate visual networks and picture what you are saying. Minimise the ‘noise’ in their brain by creating a safe environment and reducing any threat. Simplify the information. Don’t focus on too many aspects at once. Wrap your feedback in a SCARF. Status – help the person feel valued and good about themselves. Focus on what they can build on. Certainty – make it clear at the start what you will give feedback on; what the focus is. Autonomy – Speak to them before the meeting and find out what they want feedback on. Get them to think about choices in how they can improve. Relatedness – build rapport and trust with this person. Offer to mentor or support to help build a confident mindset. Fairness – Be objective, fair and consistent in your approach. Keep it factual rather than personal. Create a culture which allows people to feel safe to ask for feedback. Ask broadly. Ask a variety of people who can give you different perspectives; not just your asigned evaluator. You can ask for a more in-depth evaluation than the meeting may allow. Ask often so it becomes a habit. Timing the request close to when you ‘performed’ will give you a more accurate evaluation. Our memories fade and distort with time. Negative or positive feedback is a gift. It offers an opportunity for you to improve. Either way, avoid discounting it. An example would be if someone praised your speech and your response is ‘Oh it wasn’t that good, I hardly did any preparation’. Remember to thank the person for it. Accept feedback graciously with no repercussions. Effective evaluations are an important part of Toastmaster meetings. They provide an opportunity to hone a key leadership skill of giving constructive feedback. Why not sign up now to be an evaluator at the next meeting? As General Evaluator, my role is to give feedback on the meeting as a whole, and to evaluate anything that would not otherwise be evaluated. As the written evaluation doesn't have the time constraints of the spoken one, I can give a fuller report here. I had six areas I picked out to look at. Rachel Knowles is the master of a structured evaluation. She stated at the beginning the three areas she planned to look at (in this case, Start, Story, and Summing Up – which, cleverly, was also the structure of her speech), making explicit use of the rule of three. (Three is a good number. It's just enough to establish a pattern, but not too much to remember.) However, she added to that by splitting each of her sections into three parts, generally a commendation, a recommendation and a further commendation. She finished positively with a call to action about how to make the speech even stronger. My suggestion for Rachel is to be more direct with her recommendations, and to avoid phrases such as "What I would recommend is, perhaps…". "I recommend" comes across as a much stronger statement. Jennie Dalton's great strength as an evaluator is that she gives reasons for each of her recommendations. She linked her comments to the goals of the speaker's project. Her conclusion was a little lacklustre, ending with "So, congratulations" rather than an encouragement to improve further. Chris Vowell structured his evaluation around the questions in the manual, which is an effective way of making sure one covers everything. However, the manual questions tend to skew to the positive, which can leave an evaluation short of recommendations – the only one I picked out was 'be more emotive'; while that's a great aspiration, I'd prefer to hear something directly actionable: 'be more emotive – for example, instead of [x], try [y]'. Chris makes a point of beginning his evaluations with formal and heartfelt salutations, where others often either forget or use them over-casually. Steve Graham is a natural comedian, and began perfectly in the context of responding to being roasted, with a determined "Right." I especially liked that his recommendations were things anybody in the audience could pick up and use – for example, leaving a blank slide when you don't want your audience distracted from your words. Caroline Brewer, like Rachel, used a solid structure as the foundation for her speech. She was positive and encouraging about the Table Topics Master, and gave several good recommendations. I particularly liked "The ending was a little bit [downward gesture] – it could have been a bit more [upward gesture]." My only recommendation is that the evaluator could have used more of the time available to her. One final commendation: the standard of evaluation was extraordinarily high. All five evaluators made a point of talking to the audience rather than to the speaker, and offered well-structured analysis of the speech at hand while giving pointers useful to everyone in the room. At Casterbridge, we pride ourselves on the welcome we give our guests. I was pleased to see Toastmaster Dave Smith greet Ese and Sophie warmly as they arrived, and that every time I looked over, someone was talking with them. The Sergeant at Arms, President and Toastmaster all made a point of welcoming them by name. The clock was placed face down on the timekeeper's table, for want of a battery. That struck me as odd; if we're not using the clock, it can be put away. A previous General Evaluator noted that open curtains caused a distraction for the audience; they were closed tonight. I'm glad that previous GE comments have been followed up on. Sergeant at Arms: Rosie Barfoot. Rosie welcomed us to the meeting with a warm smile and enthusiastic words. I'd like to see a more forceful use of the gavel and perhaps a little more volume. Toastmaster/Warm-up: Dave Smith. Over the last year or so, Dave's confidence and competence have grown enormously. He gave a solid run-down of the Toastmasters etiquette and linked the speeches together with humour. I thought that using a choice of questions for the warm-up was an interesting twist. Timekeeper: Annabel Wilson: This was Annabel's first time in the timekeeper's role, and she did an excellent job of keeping track of the speakers' times – I'm not sure I've ever seen a more organised timekeeper! Usually, when someone is doing this role for the first time, a more experienced member is informally assigned to shadow and offer advice, and I wonder if this should be made a more formal arrangement. Topics master: Sophie Jones: It must be quite daunting going to another club to take a role – although Sophie let slip that she'd been test speaker at the Mayflower conference, so a dozen friendly Durnovarians would hardly constitute a challenge. She explained her role, and that of the table topics speakers, very clearly – even reminding us of the target times. I was a little surprised at the choice of speakers (I would have expected the Sergeant at Arms and Toastmaster to be picked ahead of General Evaluator and Topics Evaluator), but was glad of the chance to speak! Her choice of topics was nice and open-ended, and gave everyone a chance to say something. Her ending was very clear as well: "I now return control to the Toastmaster." Owing to an unusually full speaking programme, we didn't have a Grammarian scheduled, for the first time in many months – which means it falls to me to pick out some phrases that caught my ear. I enjoyed Christine's "dippy-dips", but puzzled over Laura's "a couple of drinks or two." Dave occasionally dredges up words like "copious", but occasionally resorts to a "very very very long time" – rather than the "aeons" he dropped in at another point. Jennie, at one point, realised she was facing the wrong way and referred to "talking through [her] back," a wonderful turn of phrase. A couple of people made use of tailing off or pausing to avoid swearing: "You can't see a… thing" and "I knew he was going to talk a load of…". This meeting was notable in that I saw several people slip up and – almost before I could make a note of it – someone had stepped in to put it right. For example, the Sergeant at Arms neglected to mention the fire exits, and the President immediately pointed them out. The timekeeper was unaware of the "all three lights" protocol, and she was gently reminded of it. The Toastmaster mistook a guest's name and was corrected politely, with no offence taken on either side. An evaluator left his glasses at his seat, apologised, and asked someone to pass them to him; it was put right in an instant. There's a danger in taking that too far, though. If someone is struggling with their words, it's rarely the correct thing to finish their sentence for them. It's occasionally correct to offer help, but we must allow people to make at least an attempt at fighting their own battles first. We each have a responsibility to help others learn, but we also have a responsibility to do it and appropriately. On the flip side, we have a duty to improve ourselves, and also a duty to accept feedback gracefully and gratefully. I felt that, on the whole, we exemplified both sides of that. In summary, we had four top-quality speeches on widely-varying subjects, all evaluated at a high standard. We had a Table Topics session full of well-judged questions and thought-out responses, and the whole thing was held together by a Toastmaster who's becoming more of a natural every time he performs the role. I look forward to the next meeting! Introductory presentations: Sgt. at Arms (Rachel Knowles) gave a comprehensive overview with extended information as to how to find the female toilets! President (Beverley Hepting) gave a warm, energetic introduction to the evening. Timekeeper (David Smith) gave a boisterous overview of his duties and demonstrated the lights but, because the lights are set behind the audience (and thus not easily visible to them), neglected to mention the colours as they were demonstrated. Grammarian (Caroline Brewer) with her ‘word-of-the-day’ “Initiate” gave an excellent overview of her duties and gave examples of variations to be used. (Comments: Better to fix the ‘word-of-the-day’ script to the front edge of the lectern and the timekeeper’s table BEFORE the meeting and then fold the script back over the lectern. This speeds up the meeting and gives a speedy reveal when the word is presented. Also, the Grammarian’s duties should also pick up “Ah-Words”: ‘err’, ‘um’, ‘so’, overuse of ‘and’, etc. (What I call ‘Vocal Dandruff’.) The word of the evening could well have been ‘and err’ by its frequency of usage! Evaluations & Education: 1st Evaluator (Annabel) gave a very comprehensive evaluation of Ali’s ‘Icebreaker’ speech. Good that she picked up Ali’s use of ah-words although, regrettably, her evaluation was sprinkled with lots of them too! Our 2nd Evaluator (Beverley) gave an incisive appraisal of Richard’s ‘Icebreaker’ with good nuggets to learn from – the usage of timing, stress, pauses and brevity. The Education Session (Colin Beveridge) covered the judging for a Speech Competition. This was a good overview but a bit uninspiring in its delivery and could have used a flip chart to better demonstrate the marking procedures. Our Table Topics Evaluator (Siobhan) gave a brief resume on those involved in considering “If Only,” (a great subject for T.T.’s from Rosie!) with some nice nuggets for the speakers. General Comments: In addition to “Ah Words” there were two other issues. It’s important when speaking to gauge the volume required for the room – some were a bit quiet and difficult to hear. Above all, always place the lectern in the middle! Placing it to one side means that a speaker will naturally speak to that side with eye contact and body language focused there as well. The lectern is not needed for Table Topics and should be placed against the side wall. Overall though, a very good meeting! If you know anything about our meetings at Casterbridge Speakers, the Dorchester based Toastmasters International Club, it will be that everything in the meeting is evaluated, but you may not know that the club itself is evaluated twice a year by an Area Director. Toastmasters uses its “Moments of Truth” statements as criteria for measuring the quality and effectiveness of clubs. The most recent club meeting, on the 1st February 2017, was one such occasion and therefore this blog post is a summary of the feedback given. The main purpose of the club is to encourage our members to practice and develop their public speaking and leadership skills. Given the majority of guests are visiting us because they have some anxieties around public speaking and are looking to build up their confidence and their skills, a warm and friendly welcome is particularly crucial. The current evidence suggests that we usually get this right, with five new members joining in the last 6 months, but some recent feedback highlighted the importance of an ongoing focus on creating a positive guest experience and we must avoid complacency in this area. New members are the life blood of the club. Making the transition from new member to confident contributor, where you are speaking regularly and taking on meeting roles, may to many seem like a daunting step. The club has an on-line induction programme, which is there to help, and with the additional support of an induction buddy, everyone is encouraged to develop at a speed which suits their own needs. Indeed, the amount of resources that are available both locally and via the TI website are incredible; anything you could possibly want to know about public speaking and leadership is readily (and usually freely) available to you. The club has access to excellent training materials which are great for educational slots in meetings, and it could make more use of these, particularly at the moment with so many new members. The club relies on everyone taking on the various leadership roles, not only in the meetings but on the leadership committee. Leadership roles can appear daunting at first glance but it’s a lot about team work, sharing responsibilities, and keeping in touch to support what’s going on; nobody is left to ‘sink or swim’ in Toastmasters. The first step is connecting as team. Good preparation will always be at the heart of a well run club and a well run meeting. Andrew Knowles was the Toastmaster at the most recent meeting, and ably demonstrated the value of good preparation. He set a theme for the evening and seamlessly navigated us through the agenda, returning to the theme for each of the links – it was inspirational. Each of the evaluations was both well structured and well delivered; with Beverley Hepting setting the standards and the other evaluators looking to reach the ‘bar’; Ron gave his first evaluation and walked away with the award for best evaluator. The meeting began with the very sad announcement by President Bev Hepting that Dryden Pennington passed away on Tuesday 17th Jan. We all agreed with her proposal that we made the meeting an exceptional one as a celebration of his friendship and support of the club as a founder member. He will be sadly missed. We then welcomed two guests. The meeting then moved on with David Smith lifting our spirits in his usual and inimitable manner, with a meeting theme of ‘Winter Warmers’ the warm up for which elicited some interesting responses. Timekeeper Colin Beveridge then explained his role, assisted by new member Ali Dolphin. Grammarian Andrew Knowles gave us the challenge of the word ‘infer’ to use, but with the added mystery of offering no definition for the word or its usage. Our first speaker was Rachel Knowles, with a speech entitled ‘Betsy’s Story’ set to be an inspirational presentation for a women’s group. She certainly inspired us with her story of the life of Elizabeth Fry and what she overcame to become an icon of progressive womanhood, and an example to everyone of whatever gender, that persistence and courage will achieve whatever you set out to do. Our second speaker was Luke McLachlan, with a speech entitled ‘uko freshi’, in which he told the moving story of a little boy he sponsored in Kenya, and how he had visited the Gideon Orphanage where he lived. The speech was full of humour and a very touching pathos, and fully achieved the purpose for which it was given, ‘how to say it’. I believe everyone in the audience was impressed with what he had to tell us. The evaluator for Rachel’s speech was Steve Graham, who, as an experienced speaker himself, was able to offer a good mix of encouragement and advice to her. He pointed out that the speech would be suitable for delivery to an audience of any gender, and commended her for using a script to ensure accuracy when using a quotation. The evaluator for our second speaker, Luke, was Richard Howes, who gave us a very structured and powerful evaluation, commending Luke for the simplicity of his language, and the power of his message. This presentation was exception as it was Richard’s first evaluation, and he delivered it excellently. Well done Richard! After the break we moved on to the Table Topics, which was presented by Alex Picot. Based on the events unfolding in America this week, he loosely based his topics on inauguration and subjects surrounding it. The first speech was by Bev Hepting with the brief of what would be her mandate for the next four years if she was to become President of America. In one sentence, her solution to all ills was to bring colour into the lives of everyone. The second to stand was Ron Kirby, asked to specify his suggestions for the celebration of his inauguration, which he concluded would be best observed with a Guinness drinking competition. 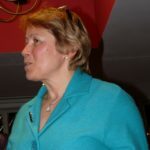 Third was David Smith with the challenge of music for his event, to which he responded that her would have invited Status Quo, but as they were unavailable, he would be happy with a good brass band. Fourth came our new member Ali Dolphin, with an excellent and healthy menu for the occasion. Next at fifth, came Chris Vowell, who had to specify who he would invite as guests. Colin Beveridge was sixth and would protest against the Trump regime with the group ‘Mathmaticians against Trump’. Lastly, guest, Annabel Wilson, would pardon the inmates of Guantanamo Bay Gaol, and a selected number from death row. This concluded the Table Topics which were then ably reviewed by Rosie Barfoot, who based her evaluation on three points, confidence, content and conclusion, with strong recommendations to all participants. Her advice was that following selection of the participant for the table topics, the question they have to address should be repeated. Our grammarian’s report followed, with Andrew providing the definition of his selected word for the evening, followed by an explanation of the difference between the work ‘infer’ and the word that is frequently confused with it ‘imply’. He suggested that maybe language is evolving and that is why the words appear to be becoming interchangeable. With the timekeepers report, the meeting having to a great degree run to schedule, and the review by the General Evaluator, Christine Wallach, in which she suggested that the Table Topic questions should not be so difficult as to deter new members and guests from participating, and a call to action to make sure that our speeches are audible and our diction clear, the meeting was closed by Bev Hepting. Bev Hepting – Best Table Topic speaker. Giving feedback is a critical skill for all Toastmasters. Leaders and managers in the workplace can use it to develop and motivate their people. It is key to improving performance. The latest neuroscience research shows how we can have greater impact and give more effective feedback. The Neuroleadership Institute runs an annual summit to look at how this research can be utilised in the workplace. You can access some live sessions on line. Here is a précis of my insights from the session I watched in 2016 on giving feedback by Dr Robert Kegan, Harvard. The human brain predominantly works on visual messages. For feedback to work, we need to ‘paint a picture’. People have to ‘see’ what they are doing. This creates insight. You need to enable the receiver to visualise the future, compare with past behaviour and make their choice about action. It is important to minimise the threat response. I believe using David Rock’s S.C.A.R.F. model can help influence uptake of your message. Status – help people save face, don’t belittle or patronise. Give praise wherever possible. Show you believe in them. Certainty – be clear and specific about what is expected. Autonomy – allow the receiver of feedback choice in how to improve. Relatedness – build a trusting relationship where people are open and honest. Be supportive. Fairness – make sure your feedback is fair and objective. 10 Steps for Building a Culture of Feedback. 2. Remember the person is not expected to be perfect, but they are good and can get better. 3. Quit your second job, which is to protect your ego, look good and cover up weaknesses. When you let go of your ego, you can help others more. The person giving feedback should be as vulnerable as the person receiving it. Share your lived experiences. 4. Don’t be afraid of making mistakes. Fail frequently, fast and forward. Mistakes are a learning opportunity. This applies to the evaluator and the speaker. 5. At Toastmasters, we have a culture of continuous feedback which is challenging and supportive. Feedback is one way ‘to turn the big ship around’. If you think of a massive ship, it only needs to make small changes early enough to change its course significantly. Don’t wait until you hit the rocks to make those changes. 6. Rank doesn’t have its usual privileges. Accept feedback from all quarters. Take the ego out. The revolution of feedback is about moving from giving to asking for feedback. 7. Don’t run around on your backhand! If you focus just on your strengths and avoid areas for improvement, you are unlikely to grow and get better. 8. If evaluating a leadership role, use the job role as a tow-rope to stretch people, not bind them. They may have a different way of doing it. If you keep on doing the same thing you’ve always done in the same way, there is no room for challenge or growth, which can be de-motivating. 9. See it as PRACTISING to get better; not as performance. A meeting is a place to get better. Work on yourself too. It is about respecting each other and being open and honest. 10. Rethink if what we are doing is fit for the 21st century. We look back at slavery as a terrible thing. Those at the time felt it was right. How will people look back at our era in 50 years time? How will they view our practices? What do you want them to be saying? Start with yourself – challenge yourself to evaluate. Emphasise what top performers do. Show people what this looks like. Build this into your evaluations. Giving feedback is a vital skill and people require training in how to do this effectively. One of the best places to experience a culture of evaluative feedback and to hone your skills is at a Toastmaster International meeting.